One simple solution helped this enthusiastic group of tour guides focus on what they love most: sharing their city with visitors. Most of the people know about the city of Amsterdam. But nowadays more people also get to know about the small city next to Amsterdam, which is called Haarlem. Haarlem has many great things to offer. It’s similar to Amsterdam, but smaller, easier to navigate, and perhaps even more characteristic of the Netherlands. 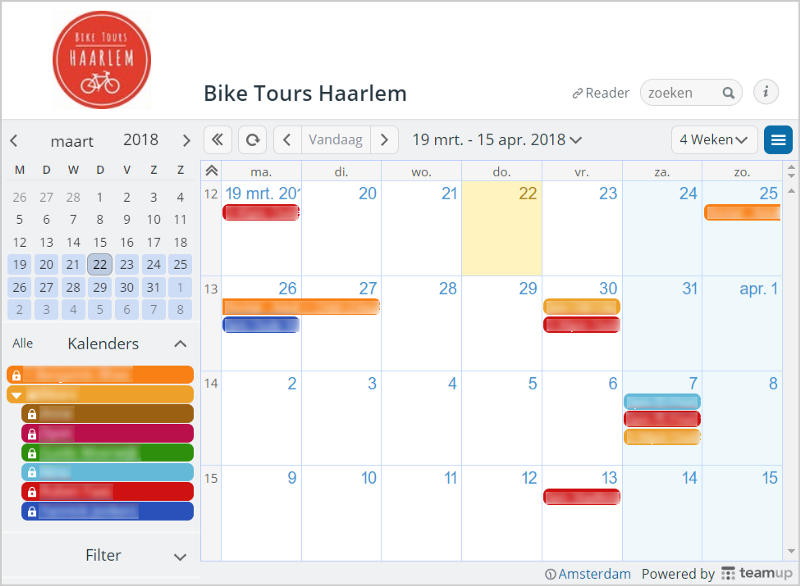 With Bike Tours Haarlem, we’re offering bike tours in and around the authentic city center of Haarlem. We help visitors to experience Haarlem like a local, on great Dutch bikes with enthusiastic tour guides. Our goal is to show all the great places Haarlem has to offer. We do this not only with guided bike tours, but also with easy bike rental. It’s an awesome experience when visiting the Netherlands! We have a team of more then 15 Local Bike Guides. They are all working other jobs as well. But they do share one common interest, which is the city of Haarlem. They are all very enthusiastic about sharing the city of Haarlem with visitors, and they are all experienced bicycle riders. On every bike tour booking, we want to assign the best, most suitable tour guide. We were handling this process manually, with individual emails, text messages, and phone calls. This was not only inefficient, it was also hard to keep track of all the bookings. We needed a way to have a single, shared overview of what tours are upcoming and which tour guides were leading them. Our core business is to let people experience Haarlem as a local on a bicycle. This is what we want to focus on, so we needed to find a good, efficient, and fitting solution. Nothing complicated, just simple and functional. Before we discovered Teamup, we tried to work with several other applications. Since there are many applications available on the market, it was actually pretty hard and took a lot of time to find out which one woudl work best for us. We found that most of the applications are very advanced, require a complex installation process, and don’t provide a clean and easy overview for our tour guides. A friend of mine advised me to give Teamup a try, so we did. We started to use Teamup and in less then 5 minutes everything was operational. We created calendars and shared the link with our tour guides. In minutes, we streamlined the process of having an easy overview for everybody on the team. Easy overview for all our tour guides, with no complex installation needed. Easy to set up and start using the application right away. For us, there’s one big benefit: our Teamup calendar fixed all our current challenges related to schedule and bookings. Story Submitted by Benjamin at Bike Tours Haarlem – Thank you Benjamin for sharing this wonderful story!